Doesn't this look beautiful? My family was so surprised when the last course of my menu was served. First they didn't know what I meant with a "fake" dragon fruit. 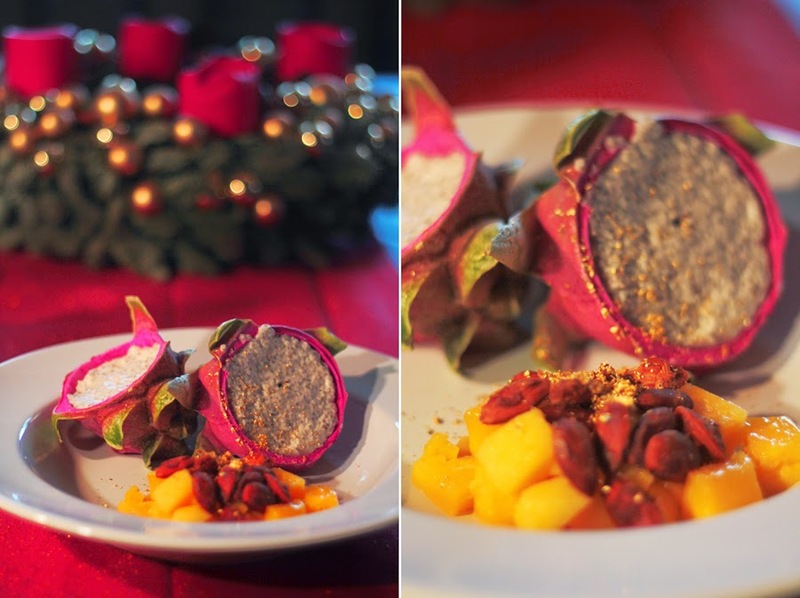 I used the skin of my dragon fruits and put it into the freezer to have it as a bowl for a coconut chia pudding which I paste into the dragon fruit skin. I left the fake dragon fruits in the fridge for about 30 minutes to have the pudding cooled down. You can find the recipe HERE. On side I put some fresh and cooled mango pieces, which I cut into cubes and topped with roasted almonds. I went into a nut shop to buy high qualitative and fresh almonds which have a more intensive taste in my opinion. Those I put into a pan [200gr] with 1 table spoon coconut sugar and a sprinkle of water and left it in the pan for a while by mixing it gently and continuously. I waited for the almonds to cool down in the pan and placed it on the mango. On top I put some gold leaves, found in a food shop in the internet. This is actually a quiet simple recipe which looks totally impressive and tastes heavenly and not to forget the delicious smell of roasted almonds..! See: http://goo.gl/X2prsX for more beauty secrets!